The steel skeleton transported across seas and along the Amazon River, today creates a true landmark of Manaus. The structure doesn’t only provide cover for fans, but it’s also a strong aesthetic statement itself. Does it create an impression of a traditional Amazon basket, like GMP Architekten claim? Regardless of the interpretation, it’s captivating. Jury Member Mike Bell: This is an innovative design that will likely find itself copied. It has a wonderful clarity of pattern inside and out. It is a great structural gesture which make ground contact in a way that the user can touch and relate to. This is one of my favourites. The stadium also provides interesting sustainability solutions, again utilizing the steel framework which collects rainwater and allows for its reuse. “Very strong sustainability credentials are noted as well as the local design references and the manner in which these have been realized in the execution, furthermore the urban connections appear to be well made”, Bob van Bebber sums up. Selection of the Amazon city to host the World Cup raised some concerns, but it's worth keeping in mind Manaus already had its legendary stadium in need of upgrade in the exact same spot. "While some might lament the wiping out of the almost 40 year old “Vivaldão” Stadium, designed by legendary local architect Severiano Porto, there is no doubt that GMP managed to replace it by another beautiful “gem”. 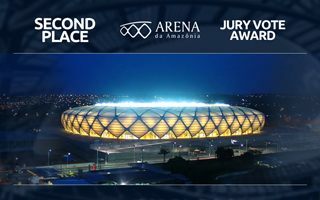 The new stadium’s simplicity and clarity makes it an impeccable and powerful architecture achievement in the heart of the Amazon", says Bruno Campos, our Juror from Brazil.